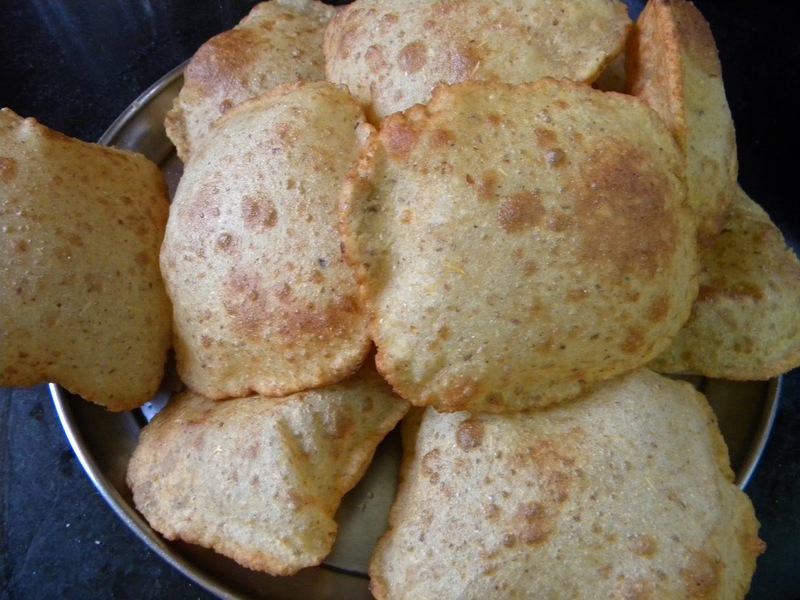 I make poori mainly on festive occasions or when I am hosting a traditional dinner. Whenever I make poori, I usually fry some extra to have them with pickle the next day. It is a great travel food since it remains fresh for 2-3 days. 1. Take atta in a bowl and add salt, carom seeds and 2 tablespoon oil. Add water slowly and knead into stiff dough. Adjust water to get the right consistency. Puri dough should be stiffer than chappati dough. Let it rest for 1/2 an hour. 2. Take a lemon sized ball (peda) out of the dough. Roll out into a 3-4 inch circle on a lightly oiled surface. 3. Heat oil in a kadhai (heavy bottomed vessel). You will know the oil is hot enough by dropping a small portion of dough into the oil. If it sizzles and comes to the surface, your oil is ready. Turn the heat to medium. 4. Gently slide the poori (rolled circle) in the oil. Fry by pressing lightly by slotted spoon (chhari, pauni). Poori will puff up. Turn over the puri and fry from other side also. Fry till golden brown. Drain by the same slotted spoon on an absorbent paper. Similarly fry other pooris. Enjoy poori bread with aloo bhaji (potato curry) and pickle of your choice.